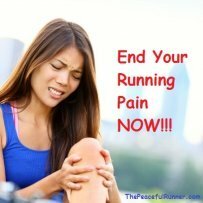 Join the Peaceful Runner Club! 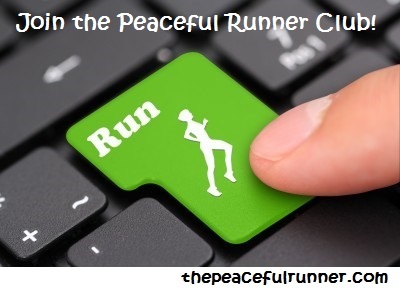 Are you a member of the Peaceful Runner Club? 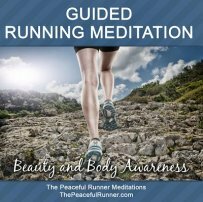 Find out if you meet our criteria and qualify to be a peaceful runner. If you feel you are a peaceful runner, join the Club. It is free and easy to join. Just add your comments below and you will become a member of the Club. Club members receive an automatic entry in our contest giveaways. Check out our first giveaway here: contest giveaway. What is a Peaceful Runner? You must meet the following 10 criteria to be a Peaceful Runner. If you are, sign up below and welcome to the Club! loves running (most of the time). strives to enjoy every moment of every run. is dedicated to making running fun and easy. does not judge him/herself if they have had a difficult run. accepts that he/she, others, life and weather conditions are not and never will be perfect. is committed to becoming a better and more efficient runner. is committed to caring for his/her body, but does enjoy occasional indulgences. values his/her fellow runners and supports them by encouraging them, giving advice, being kind or just having a post-run coffee or beer together. is grateful and happy just because he/she can run. wants to be able to run long after everyone thinks he/she is too old to run. Does this sound like you? Great! Join the club by adding your comments below. Tell us why you are or want to be a Peaceful Runner. Maybe one of the reasons above resonates with you or has special meaning to you. 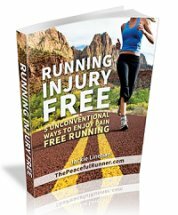 Maybe you have a special reason of your own for wanting to be a Peaceful Runner. Share your thoughts with us and remember that Club members are automatically entered in our contest giveaways! If you would like to share your favorite running picture, you can upload that too. We love to see pictures of our Club members! Note: Your picture must be less than 1 MB to be accepted. Remember to include your email address. It will not be displayed online. You will need to select one of the notification options to add your email address below. You will then receive notification from us when your comment is approved and you are a member of the Club. The notification options appear after you click on the "Submit your comment and join the Club!" button. If you have any questions, feel free to contact us any time. Your comment will appear on a Web page exactly the way you enter it here. You can wrap a word in square brackets to make it appear bold. For example [my tip] would show as my story on the Web page containing your story. Do you want to share your favorite running picture? Great! Click the button and find it on your computer. Then select it. Click here to see the rest of the form and complete your membership. Read Other Club Members Comments! I've returned to running after more than 15 years and a serious back pain. It's not only running but life. To keep going and be motivated at all times! I do have a hard time with not judging myself. I am slow, but competitive & that can be a difficult combination. Loving the idea of being a peaceful runner!! Can't get enough of running! I'm 62 years old and love running and feeling the breeze in my face. I want to enjoy every moment of every run!